Originally written by Lee Bryant on February 9, 2015. The E2.0 Summit in Paris last week was a great chance to catch up with what leading companies are doing to take forward their E2.0 and social business efforts beyond technology adoption and towards Digital Transformation of their organisations. My keynote there was about the idea of a Quantified Organisation as a method for managing and measuring Digital Transformation. The slides are embedded below, and an outline of the talk follows. The curator of the E2.0 Summit, Björn Negelmann has seen the field evolve considerably over the past decade, and asked in his introduction whether we might have reached the trough of disillusionment in the classic innovation adoption curve in the famous hype cycle graph. If so, that means we are the second best time to invest in E2.0, just as it emerges into real adoption and productivity (the best time being before it entered the hype curve around 2007-8). That is when real organisational impact can be achieved on a much wider scale than the early adopters we have seen so far. In other words, when the existence of an enterprise social network and related apps is taken for granted, in much the same way as document storage and email servers, then we can start to think about what new behaviours, new structures and new practices they make possible. At the Summit, it was clear that many companies had reached this point, having won the battle for social technologies to be taken seriously, and having arrived at an initial plateau of adoption. This is what we meant by the Shift Has Happened, which was our founding thesis for PostShift. Companies like Bosch, Continental, Bayer Material Science, BASF, BNP Paribas, Bouygues Telecom and others gave a fascinating insight into how they organise their E2.0 adoption efforts and how they measure their success. We have seen this with our own our work at Bosch, which began three years ago with support for their E2.0 adoption and rollout efforts, but which for the past year or more has focused on what new organisational structures and ways of working this platform makes possible. This is a great example of a company that understands the goal is not technology adoption but rather digital transformation. But whilst most companies are tracking low-level KPIs regarding usage, adoption and in some cases even impact on existing business processes, there is a clear need for better ways of talking about the organisational impact of social technologies that is more specific than just describing the long-term characteristics we hope will result. 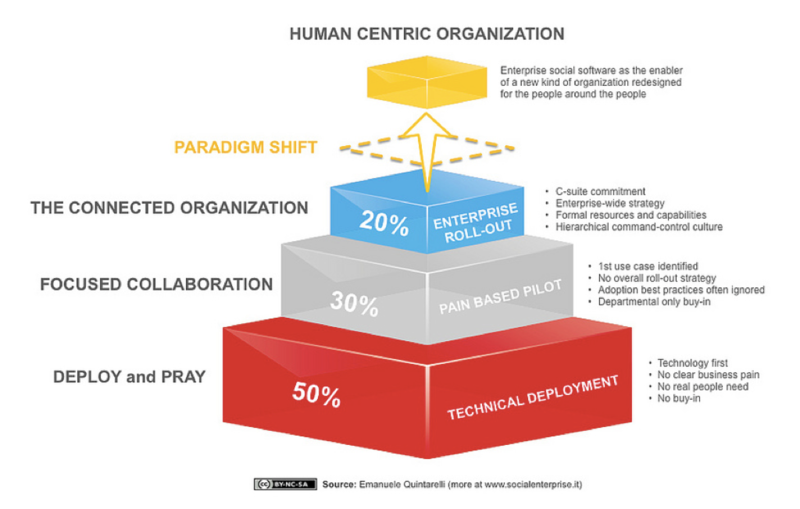 Emanuele Quintarelli shared an interesting graphic last year that suggested most ESN deployments fall into the ‘deploy and pray’ category, a minority address known pain points and use cases, whilst only about 20% of projects involve a concerted organisation-wide roll-out aimed at creating a connected company. He argued that some kind of paradigm shift is needed to go beyond just adopting social technologies towards creating a new kind of organisation designed around people- and network-centric principles. What is the goal of Digital Transformation? What is the purpose of our organisation and what capabilities does it need to meet the challenges of the future? 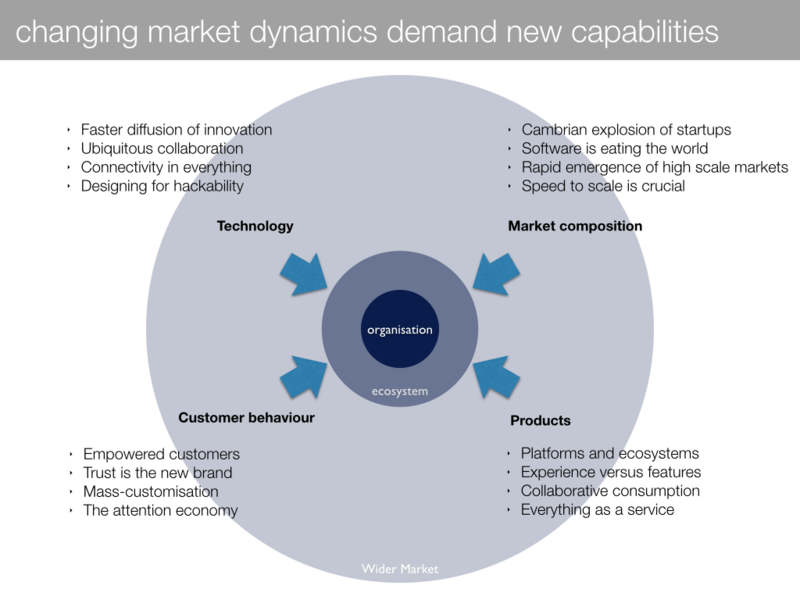 By posing the question this way, organisations can focus on the changing external market dynamics that are affecting the context in which it operates, and ask for each of them what does the organisation need to be able to do in order to cope with or (better still) take advantage of these dynamics. Instead of thinking we can predict precise future scenarios and define a Target Operating Model to work towards, a capability-driven model identifies the properties needed by the organisation to be successful in the future even if it cannot predict exactly what is going to happen. We express these capabilities in a similar way to agile user stories in software development so that they indicate clearly what is needed by whom and why, and this has the added advantage of giving something testable to work towards. Digital transformation began with organisations trying to develop the external customer-facing social capabilities to operate in a world of empowered and connected consumers, but there is now a realisation that to deliver on this promise, the internal realm – how work is organised and how people connect to deliver value – is equally important. But if we are able to improve the way we work internally and externally, and for both sides to be driven by digital capabilities, then a third area of transformation opens up, which is business model innovation. New products and services, and new ways of capturing value, become possible when the organisation is no longer over-optimised for the past. One of the most important areas where organisations need to develop new capabilities, and possibly new structures, is at the edge between the internal and external realm. 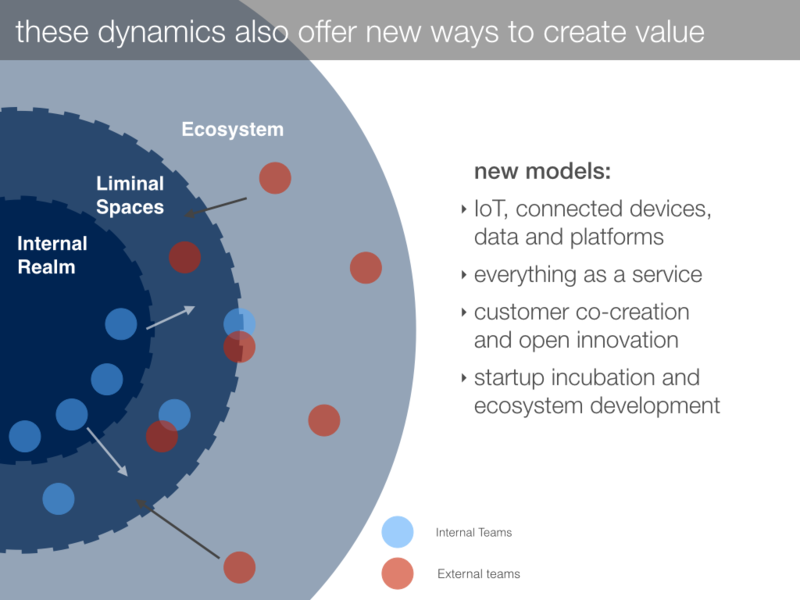 All kinds of current trends require large organisations to operate with more of a porous membrane that allows more agile working close to customers and markets, perhaps in liminal spaces that involve external teams or startup partners (e.g. hackathons, incubators, partnerships). Building and sustaining a strong ecosystem around your technology or services is one of the best sources of protection in the C21st economy. This area of digital transformation requires a set of new capabilities that most large organisations do not yet possess. As Harald Schirmer from Continental put it during the summit, “we looked at what we have, what we need in the future and what we will need in 5 years” to drive social business efforts, not just immediate impact on the existing business. Thinking about digital transformation in terms of the capabilities an organisation needs can also highlight those areas where current practice and structures are not fit for purpose. So, in addition to helping grow new organisational tissue, it can also help reduce the bureaucratic overhead of excessive hierarchical management process so that companies can start to find what we call the minimum viable hierarchy to strike the right balance between reliability and agility. 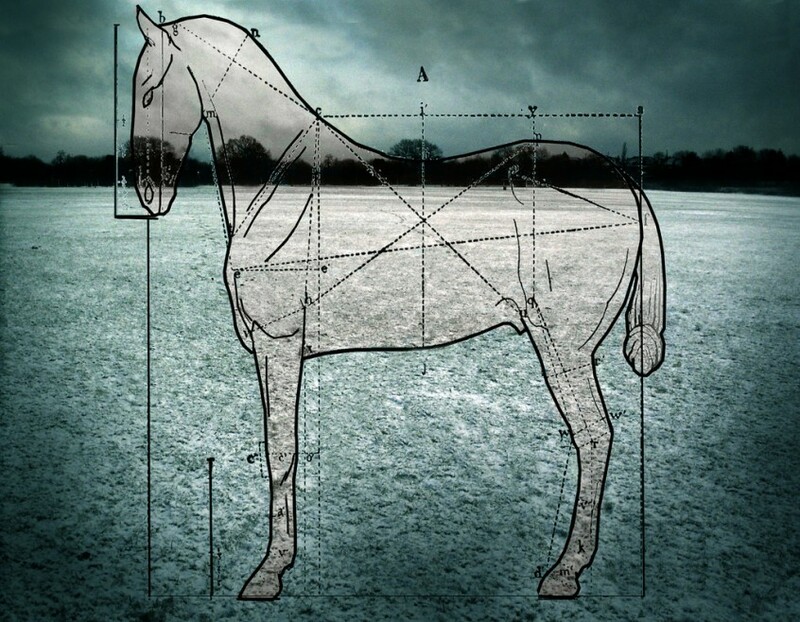 How do we manage and measure digital transformation? Top-down change programmes assume we know the destination and can plan each step towards it from the top, cascading actions and communication down through the organisation to bring people with us. Instead, digital transformation is more about gradual changes, loosely joined, that move towards the capabilities and ways of working we know we need to create. Frederic Laloux, at his recent RSA talk, said that 50% of his answers to the question how to create self-managing organisations are to recommend ‘send and respond’ over ‘predict and control’ as a way of making change happen. For him, organisations have an evolutionary purpose that goes beyond the individuals who make up the current structures. For example, Bosch and Unilever and even the RSA itself have obviously replaced their people many times over a century of operations, but somehow retain a consistent culture and place in the world that has become part of the purpose of the organisation. Recognising this, part of the challenge for digital transformation is finding this purpose and allowing the organisation to become what it wants or needs to be to fulfil it. When it comes to managing and measuring transformation, the Quantified Self movement is an interesting model for the organisation. A crash diet rarely has sustained benefit for people concerned about their health or weight, but gradual change informed by quantified self tools and data seems to work much better. So if we can define some meaningful organisational health measures, and also ways of expressing our capability stories in testable and measurable ways, then we can do the same for the quantified organisation. First, it is worth clarifying that we are talking about organisational health measures, not individual performance measurement. Ideally these aggregate measures should be entirely anonymised and abstracted from individual data, both for reasons of reliability (wisdom of crowds) and also to focus on what we are trying to achieve, which is a better organisation, not a way to micro-manage individuals. There is some very useful data flowing around organisations that can help us build this picture, but probably the best source of insight is what some people call the human sensor network of connected individuals within the organisation. Social tools give us a multitude of ways to ask questions and survey people in real-time about how they view their local neighbourhood of the organisation and how well it is working. This is just as important a data source as the raw digital data about social networks, participation, connection and communication. One goal of this approach to digital transformation is to create a kind of organisational self-awareness, sensing and responding to small problems or wrinkles that are getting in the way of people doing their job, which is why regular human input is so important. Making this an ongoing process, ideally part of every team’s weekly and monthly meeting and planning cycles, is the best way to distribute ownership of digital transformation activities. Of course we are dancing with dinosaurs to a certain extent, and as Hugh McLeod reminded us, it is unwise to try to sell a meteor to a dinosaur. But almost every organisation we speak to about its social technology efforts is genuinely interested in moving beyond adoption to become more agile, connected organisations through some form of digital transformation. If we can create the right organisational health measures, and if these are seen as meaningful indicators of transformation progress, then this model could greater strategic alignment to E2.0 and social business efforts. Our approach starts with an analysis of existing pain points, external market dynamics and the needs of near-term business strategy to define a set of required organisational capabilities that can guide digital transformation and generate business value for existing social technology initiatives. It then expresses these in terms of measurable attributes of the organisation that we can target with recommendations for actions in technology, practice and structure. We organise these into a pipeline categorised by ownership, impact, business domain (e.g. strategic level changes, major process level and small-scale use cases changes) and business priorities so that teams can dip in to select issues to tackle in sprints and mini-projects, and then re-prioritise based on outcomes. Key to the success of this approach is a strong network of change agents, or what Kotter calls a ‘guiding coalition’ that is motivated to help transform the organisation at various levels. Executive support and protected spaces are also necessary for new practices to take root without being killed off by existing practices and politics. Finally, there will be existing centrally mandated processes, for example planning, employee appraisal, procurement, HR, etc) that stand in the way of new ways of working, and it is usually necessary to find agreed workarounds for these in the short-term, at least until the trickier task of redesigning these process to be more user-centric becomes a viable option. What organisational capabilities do these require? If Digital Transformation is to succeed in creating the kind of organisational capabilities required to compete as a C21st business, then it must become part of how we operate the business, rather than remain as an external force for change, and all levels of the organisation should ideally be given a role in the process. Our model of the Quantified Organisation provides one way to achieve this. But based on discussions at the E2.0 Summit on the current state of social technology adoption in large firms, I think the model could also help companies move beyond their initial adoption plateau by providing a way to define new capabilities and new ways of working (perhaps even as small as an individual use case) that the technology could support, and then provide a measurement framework to monitor progress. This could provide a better way to demonstrate business impact than both adoption KPIs (too low-level and only proxy measures for value) on the one hand and big picture aims and objectives (‘be more connected!’) on the other. It was great to have the chance to share this concept at the Summit, and we would really welcome any feedback from people involved in social technology or digital transformation projects.